Master guitar maker Arnulfo Rubio Orozco holds up his latest project. It's taken him a month to craft this guitar with pearl accents and wood from southern Mexico. 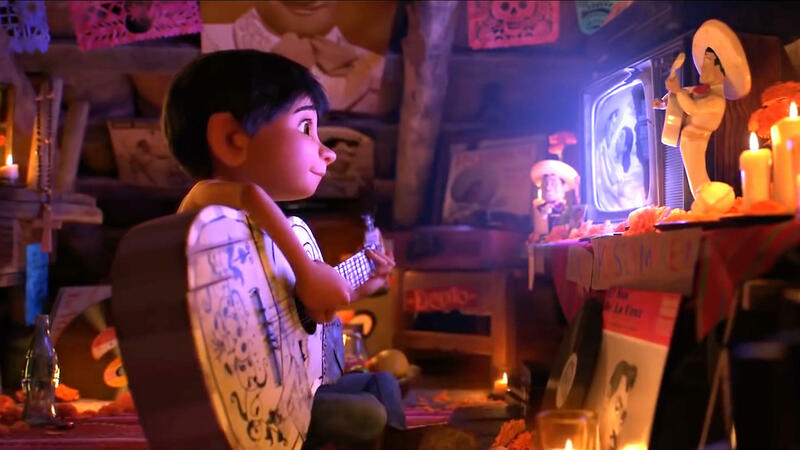 A scene from the Disney-Pixar animated movie Coco, about a young boy, Miguel, who dreams of becoming a musician despite his parents' objections. The town of Paracho, in the western Mexican state of Michoacán, has a long history of guitar making dating back to the 18th century. The guitar featured in Coco was designed by a former resident of Paracho. Guitar makers in the town have been enjoying a sales boon ever since the movie debuted late last year. 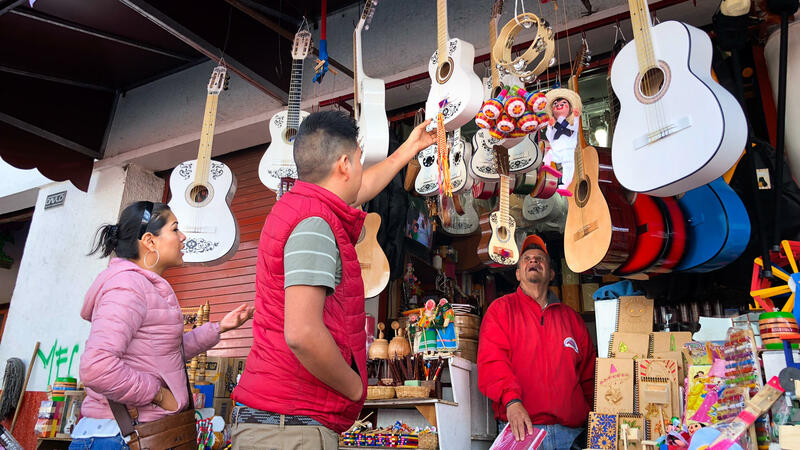 Guitars, especially white-painted ones, in the Mexican town of Paracho are selling fast thanks to Coco. "We are all loco for Coco," one shopkeeper says. César Ivan Lemus, a third-generation Paracho artisan, shaves the neck of a guitarrón he's making. Lemus sells all types of instruments to mariachi schools and stores in the U.S. He says he's working as fast as he can to keep up with orders these days. Workers cover a large bronze guitar statue in white. The statue sits at the entrance to the town of Paracho. This weekend, the town will pay tribute to German Vazquez, a former resident and master guitar maker from the town. Vazquez designed the white guitar featured in the movie Coco. Real-life sales of guitars like Miguel's guitar have soared thanks to the movie. And not just in U.S. stores. A small town in Mexico's western highlands, famous for its generation of guitar makers, is also enjoying a Coco boon. Paracho, in the state of Michoacán, is the former home of the very guitar maker who helped design the instrument seen in the film. Now living in Los Angeles, 65-year-old German Vazquez worked with Pixar on Miguel's guitar. Although, he left Paracho back in the 1970s, this small town hasn't forgotten him. Coco is a hit in the United States, and has raked in more than $700 million in box offices worldwide. But particularly in Mexico, it became the highest-grossing movie of all time. The town of Paracho is gaining some fame along with it. "It's impressive, everyone's gone loco for Coco," says souvenir shopkeeper Claudia Rodríguez de Velásquez. "We have a long list of back orders," she says, running her fingers over a dozen Post-it notes attached to a wall by the cash register. Ever since Coco debuted late last year, she can't keep the famous white guitars on her shelves. Her family's guitar factory down the road is churning out 1,500 instruments a week, she says. Before Coco, Rodríguez says 90 percent of their exported guitars were tan colored, with just a few painted white. Now it's totally the opposite: white Coco-like guitars dominate the orders. There's been a run on other kinds of instruments made in Paracho too. César Ivan Lemus sits in his dusty workshop above his house, shaving flat the wooden neck of a large guitarrón favored by mariachi bands. He says he's filling orders as fast as he can, selling mainly to mariachi schools and stores in Texas and California. "We are so proud that Pixar turned to a Mexican artisan to design Coco's guitar," he says. "And not just any Mexican — a former Paracho resident," he adds beaming. This weekend Paracho is paying homage to Vazquez and the movie. 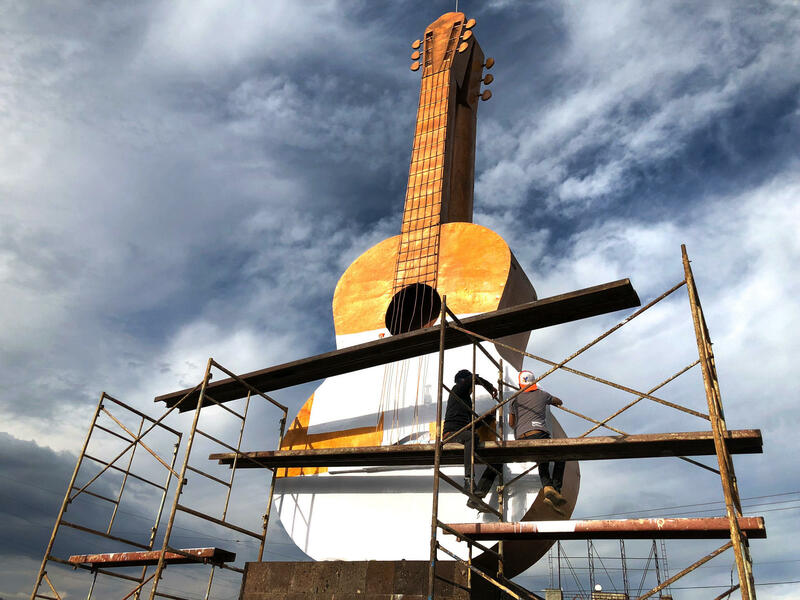 Residents decorated several streets to look like the village in Coco — set in a fictional part of Mexico — and they covered a large bronze guitar statue at the town's entrance all in white. 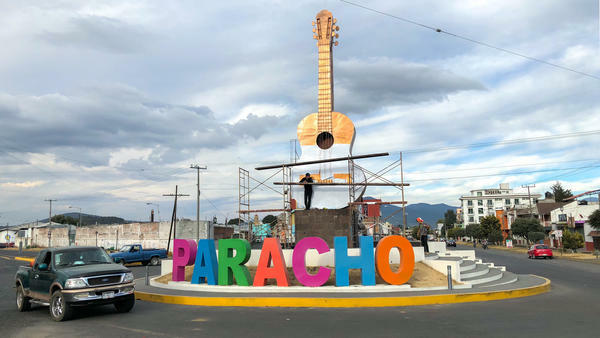 Jesús Ocampo, who works for the local government, says it's time one of Paracho's gifted guitar makers got some overdue credit. "There are a lot of people here in Paracho who have made guitars for very famous musicians around the world but they are practically anonymous," he says. He claims that other brands attempt to sell Paracho guitars packaged with their own labels, without recognition. Ocampo says there are no official statistics, but Paracho's guitar makers are estimated to export as many as a million guitars a year. The town has been in the guitar making business for centuries. Arnulfo Rubio Orozco, a master artisan who says he's a third cousin of the Coco guitar maker in California, comes from a line of guitar makers going back to his great grandfather. He tightens the strings on an instrument he's been working on for a month. With pearl details and wood from southern Mexico, it will fetch about $2,000. "My dad didn't want me to make guitars," says Rubio. Instead he was sent to work winters in a Christmas tree farm in North Carolina. "I had to sneak around, ducking into other guitar makers' workshops to learn," he says. That's almost like Miguel in the movie. He hid his dream of being a musician from his family. "I guess the story repeats itself again," Rubio chuckles. But Rubio hasn't actually seen Coco. Paracho is a small town, it doesn't have a movie theater. The Disney Pixar movie "Coco" is a favorite to win an Oscar next month. It's the story of a small boy, Miguel, who dreams of becoming a musician even though his parents don't want him to. Along the way, he finds family, tradition and a magnificent white guitar encrusted with pearl details and a black skull. Real-life sales of that guitar have soared thanks to the movie, and a small town in Mexico's western highlands famous for its guitar makers is getting a lot of attention. NPR's Carrie Kahn reports. CARRIE KAHN, BYLINE: There isn't much traffic for the lone cop on the main street of Paracho to direct. After all, the town boasts of having more guitars than cars. KAHN: And guitars here are selling like hotcakes, says souvenir shopkeeper Claudia Rodriguez de Velasquez. Ever since "Coco" debuted last year, she says she can't keep the famous white guitars on her shelves. CLAUDIA RODRIGUEZ DE VELASQUEZ: (Speaking Spanish). KAHN: "It's impressive. Everyone's gone loco, crazy for 'Coco,'" she says. KAHN: She runs her fingers over a dozen Post-it notes attached to a wall by her cash register, all back orders. Her family's guitar factory down the road is churning out as many as 1,500 instruments a week, she says, the vast majority of them painted white. And it's not just the "Coco"-inspired guitar selling out here. There's a run on all kinds of instruments made in Paracho. KAHN: Cesar Ivan Lemus shaves flat the wooden neck of a large guitarron favored by mariachi bands in his dusty workshop above his house. He says he's filling orders as fast as he can, selling mainly to mariachi schools and stores in Texas and California. CESAR IVAN LEMUS: (Speaking Spanish). KAHN: "We are so proud that Pixar turned to a Mexican artisan to design 'Coco's' guitar," he says, "and not just any Mexican - a former Paracho resident." Now living in Los Angeles, 65-year-old German Vazquez worked with Pixar on the guitar. Although he left Paracho back in the '70s, the small town hasn't forgotten him. This weekend, they're throwing him a huge tribute. They've decorated several streets to look like the village in "Coco" and covered the huge bronze guitar at the town's entrance all in white. 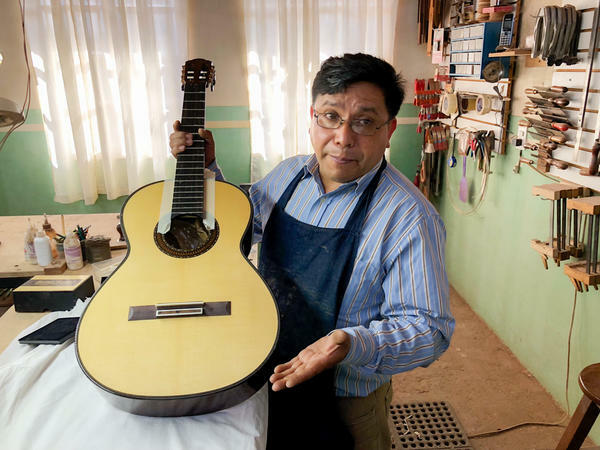 Jesus Ocampo, who works for the local government, says it's time one of Paracho's gifted guitar makers got some overdue credit. JESUS OCAMPO: There are a lot of people here in Paracho that have made guitar for very famous musicians around the world, but they are practically anonymous. KAHN: And he says many of their guitars are sold under famous labels, also without any recognition. 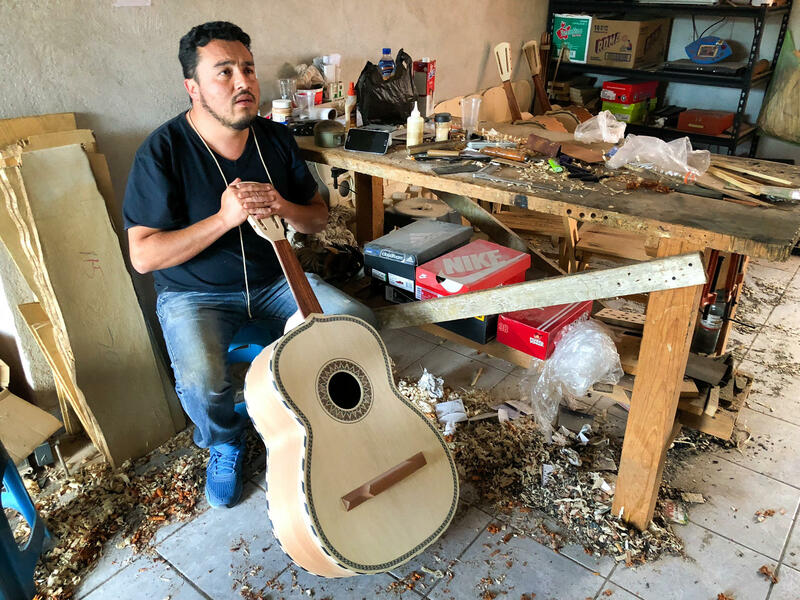 KAHN: Master artisan and cousin of "Coco's" guitar maker Arnulfo Rubio Orozco tightens the strings on an instrument he's been working on for a month. With pearl details and wood from southern Mexico, it will fetch about $2,000, a price unheard of in his great grandfather's days. Rubio is a fourth-generation guitar maker. ARNULFO RUBIO OROZCO: (Speaking Spanish). KAHN: "My dad didn't want me to make guitars," says Rubio. Instead he was sent to work winters in a Christmas tree farm in North Carolina. To learn, I had to sneak around, ducking into other guitar makers' workshops, he says. Oh, just like Miguel in "Coco," I blurt out. He hid his dreams to be a musician from his family. KAHN: He laughs, "yeah, me too. I guess the story repeats itself again," Rubio chuckles. He says he'll have to take my word for it, though. He hasn't seen "Coco." The town is too small. It doesn't have a movie theater. Carrie Kahn, NPR News, Paracho, Michoacan. ANTHONY GONZALEZ: (As Miguel, singing) In every beat of my proud corazon. Transcript provided by NPR, Copyright NPR.